Traditional Arrow Making Experience 4th May 2019 34 Nether Street Rougham, Bury St. Edmunds, Suffolk. IP30 9LW. This is a one day course teaching you all you need to know about arrow making for use in traditional longbow archery. During the course you will make 3 complete arrows. Hand make the shafts and learn how to set the spine in them correctly to match the bow you use. Forge the arrowheads from sheet metal. Splice and lace down the feathers to the shafts, plus reenforcing the nocks with buffalo horn. The location is in Rougham near Bury St Edmunds Suffolk, full details will be sent to you near to the date of the event. Drinks will be available during the course but please bring along lunch for yourself during the date. Rougham, Bury St. Edmunds, Suffolk. IP30 9LW. Make Your Own Bronze Sword 9th May 2019 34 Nether Street Rougham, Bury St. Edmunds, Suffolk. IP30 9LW. Come and make your own Bronze Sword. This style of sword is called the Ewart Park Leaf and comes from the middle bronze age period approximately 3,000 years ago, Bronze age swords differ greatly in their design but very much portray the skill set of the early metal workers of the bronze age period. This style is not only elegant to look at but is also quite light for a sword weighing around 750 grams making it easy to use in battle. Event held at Rougham near Bury St Edmunds Suffolk. 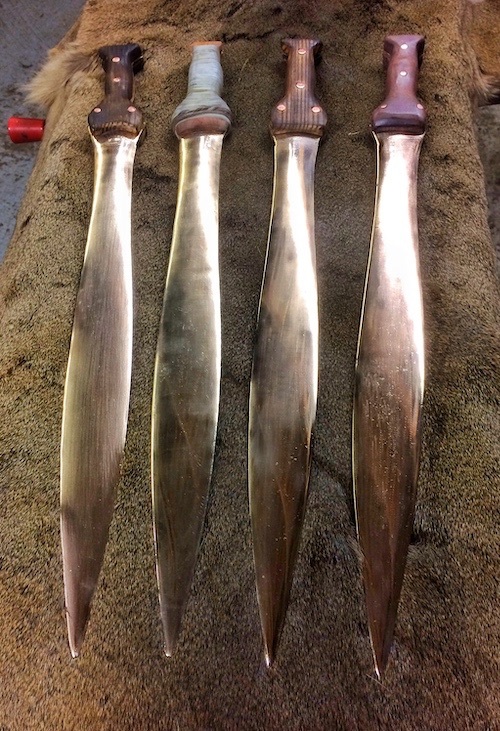 During this one day course, you will learn how to make a sand mould and pour your own bronze sword, The sword will then be cleaned up with adbrasives before the final polish and have handles fitted to them. Finally you will make a leather scabbard for your sword. These courses can accommodate 5 attendees. Bronze Age Workshop 17th-18th May 2019 34 Nether Street Rougham, Bury St. Edmunds, Suffolk. IP30 9LW. Bring the bronze age to life and discover how metal became the new tool eventually replacing stone. This is a two-day course held at Rougham near Bury St Edmunds Suffolk. During the course you will make 2 bronze artifacts that will yours to keep. Day 1 Morning build a furnace capable of reaching temperatures of 1300 degrees and smelt copper from malachite. Build a smelting furnace, using natural materials such as clay, grog, horse manure and deer hair. Using a set of hand-made bellows we then bring the furnace up to temperature, crush Malachite and roast it. We then empty the crucible into the charcoal so it can percolate down and transform into a copper ingot. We will then use the furnace to pour a bronze replica of an axe into a mould so you can appreciate the full story of how the bronze age period began. Day 1 afternoon looking at lost wax casting techniques. After making the model in wax you will be shown how to invest it into a mould for casting. Once we are happy that your wax model is well invested, they will be stored overnight to dry out and prepare for burning out and firing on day 2. Following this, using modern casting sand you will learn how to pack a mould properly into pre made wooden formers to flat cast bronze artifacts such as knives, axes and swords. Your second day involves warming things up, first you burn out the wax and raise the temperature of the mould, while this is happening we will mix copper and tin to create our bronze in a crucible using a gas furnace system, this ensures we have molten metal at the exact time we need it. once you have made your project we will clean away any flash or irregularities to produce a finished work of art in bronze. This course can accommodate 5 attendants To place a booking and see available dates please view our online shop. This two-day course is available for £375 per person. Spaces are limited so please confirm early. This course is self catered, refreshments included. Bronze Age Workshop 27th-28th June 2019 34 Nether Street Rougham, Bury St. Edmunds, Suffolk. IP30 9LW. This is a two-day course held at Will Lord’s residence.